CMS Made Simple (CMSMS) is a free, open source content management system (CMS) ideally suited to building and managing websites for small to medium businesses and organizations. 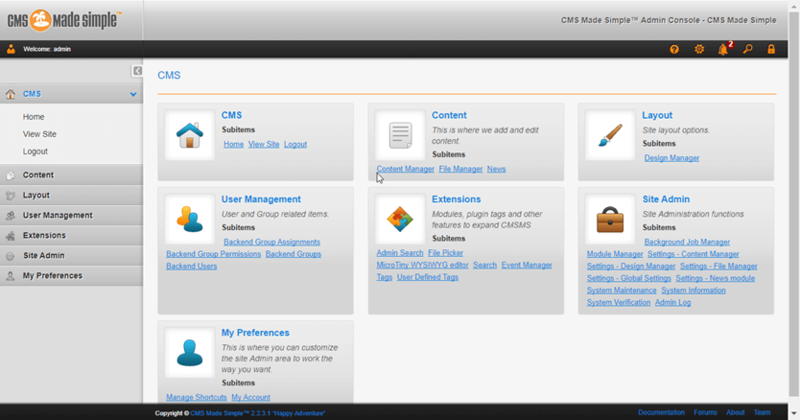 First released in 2004, CMSMS is built in PHP and uses a MySQL database for the back-end. Customization is supported through themes, addons, dynamic menus, and tags. Editors, designers, developers, and everyone else will find the thoughtfully designed simplicity and functionality they need in CMS Made Simple. Best of all, CMS Made Simple is included with your HostPapa web hosting plan and can be set up in minutes with 1-click installation. With CMSMS, editors and contributors can focus on content with a familiar editor that resembles common word processor applications. No HTML or design experience necessary! The Content Manager module is where you easily create and manage pages and the News module supports creating posts or time-based content. The File Manager module has an intuitive interface where you can create folders as well as upload and manage files and images. Create beautiful designs using the Smarty PHP template engine. Use an existing theme, create your own from within the CMSMS admin panel, or mix and match to create a fully customized design your site visitors will love. With CMSMS group based permissions, you can lock down your changes so contributors and editors can handle the content without accidentally changing your designs. CMSMS is an open source project backed by a committed development community. It’s a modular and extensible framework that integrates with any PHP application. Custom modules, functions, user defined tags, and a fully documented API allow you to create full-featured websites. For more information about CMS Made Simple, see the CMS Made Simple website and HostPapa CMS Made Simple knowledge base articles.